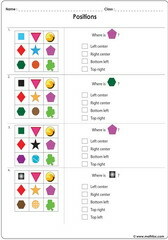 Spatial sense worksheets, worksheets on location in left, right, middle, top, bottom, center, center right, center left, top left, top right, bottom left, bottom right, inside, outside, on top, under, for children. Spatial sense math worksheets for children to practice. 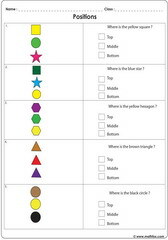 Suitable PDF printable spatial sense exercises for children in the following grades : Kindergarten and 1st grade. 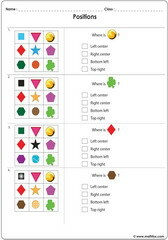 Worksheets cover the following spatial sense topics: location in left, right, middle, top, bottom, center, center right, center left, top left, top right, bottom left, bottom right, inside, outside, on top, under etc.